Labor, anti-war movements unite to protest U.S. aggression against Venezuela | Fight Back! The event was part of a global day of action to protest the ongoing U.S.-backed coup attempt against the democratically elected President Nicolás Maduro. Protesters occupied multiple intersections in the high-density Uptown neighborhood of Minneapolis, distributing fliers and speaking with pedestrians about the situation in Venezuela. The demonstration took place as the coup attempt took a turn closer to an invasion, involving a high-profile attempt to storm the Venezuelan border from Colombia. U.S. and U.K. media spent much of the day highlighting groups seeking Maduro’s overthrow, who claim to bring U.S.-sponsored ‘humanitarian aid’ into Venezuela from Colombia. In recent weeks, the International Red Cross and the United Nations had refused to participate in the U.S. plan to storm the Venezuelan border with so-called ‘aid.’ Both organizations explicitly rejected the ‘humanitarian’ label for the plan touted by U.S. officials, instead calling it politicized and concealing military objectives. On February 19, AFSCME Local 3800 passed a resolution to denounce any U.S. sanctions, support for a coup, or other interference in Venezuela, mirroring similar moves by labor groups around the country and the world, including the San Francisco Labor Council, U.S. Labor Against the War, the Canadian Union of Public Employees (CUPE), the Canadian Labor Congress, and the World Federation of Trade Unions (WFTU). The action was organized by the Minnesota Peace Action Coalition and endorsed by a long list of progressive groups. The coalition plans to hold an emergency response protest if the U.S. sends in troops. 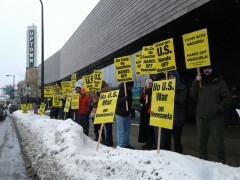 In the meantime, the next protest has been called for by the MN Anti-War Committee for March 15 at 5:30 p.m. in front of Senator Amy Klobuchar’s office, 1200 S. Washington Avenue in Minneapolis, to draw attention to that presidential candidate’s support for the Trump administration’s coordination of the coup in Venezuela.